. Why come to us? . If you love flowers, and you want your wedding flowers to express your own individuality and style, then come and talk to us. We grow lots of flowers here in Harthill. This is important - it means you will get real flowers, that ordinary florists can't usually get hold of - the wild, fragile, most beautiful, fleeting and scented flowers. We love to use them for weddings. Growing our flowers from the tiniest seeds or plants means we know them closely - intimately, we know when is best to pick them, how to use them, how best to combine them. Working with the flowers that are looking their best on any one day lends a true creativity to the design process, which shines through to you and your guests. We don't make a list of 'ingredients' and source them - we work with what is truly seasonal. this way, the flowers sit together easily and naturally. When you come for a consultation with Carol, we will talk about colours and styles, what scents and shapes you might like, maybe the feeling you want to achieve with the flowers. We can not promise individual flowers, but we will promise that your flowers will be fresh, seasonal and truly beautiful - and totally individual to you. You can trust us to select the most beautiful combinations of colours, textures and form - if you want us to copy a Pinterest board, then we will not be the florists for you.
. What we can offer . 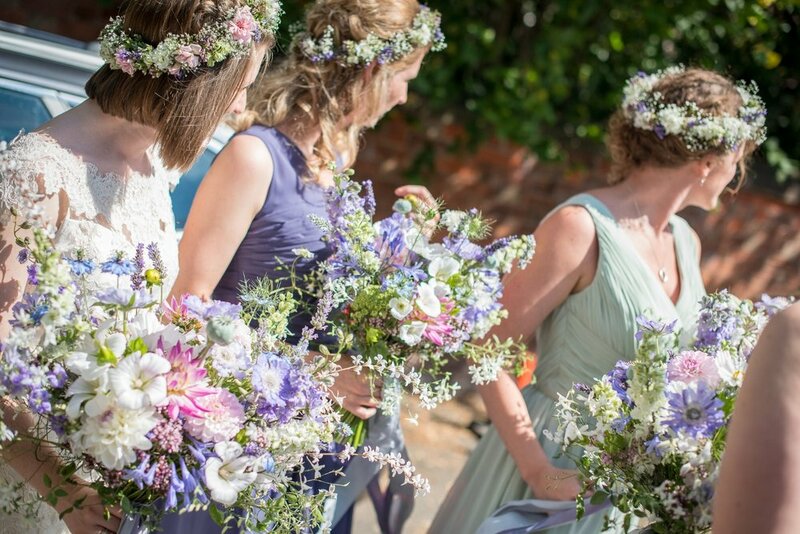 As we grow our own flowers, we can be very flexible in what we can offer you - from a fully bespoke wedding with bridal party bouquets, buttonholes, venue and ceremony flowers through to just buckets of home grown flowers for you to do your own thing. Or anywhere in between. If beauty, attention to detail, individuality and dedicated attention are top of your list, and you are prepared to pay for them, you need our full bespoke service. If you are naturally creative or perhaps you have a tight budget then you can buy just buckets of our beautiful flowers, to arrange your yourself. If this is just too scary scary, then how about our buckets and bouquets options - where you take buckets to do your own table arrangements, while we take away the pressure and make gorgeous bouquets and buttonholes - and maybe any big arrangements for you. If you are happy to just go with the flow, and are on a tight budget then ask about our 'off the peg' options, where you can order simple seasonal bouquets, buttonholes, arrangements, buckets to pick up the day before the wedding. No need for a consultation, just order by number and size. what could be simpler? Let us know the type of flowers and colours you would ideally like for your wedding.